I don't know what it is about routines and schedules, but you seem to love them as much as I do. Or maybe I just draw that type of audience? Birds of feather and all that. 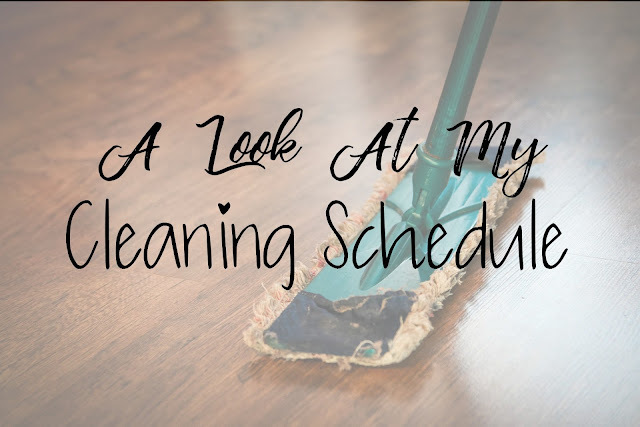 I've posted about my daily routine before and how I stay on top of everything, but how I keep the house clean enough for anyone to stop by at a moment's notice is something I probably get the most questions about. They key is definitely in the scheduling, and in staying on top of the little tasks so they don't become big, daunting tasks. Simple, not stressful. Make the Bed. I've been trying to be better about this lately, because it does make a difference in the look and feel of the room. I try to make it the very first thing I do - I'll even pull up the covers and arrange the pillows on John's side before I even get out of my side! No beating myself up if it doesn't happen though, because it's just not that important to me. Wash All Dishes. I cannot sleep with dishes in the sink, especially because we have a dishwasher. It drives me bonkers. So the sink gets cleaned up every evening. With just the two of us, we absolutely don't need to run the dishwasher every day. Probably not even every other day. But everything gets rinsed and put into the dishwasher, for sure. I run it at night on the days it's full, and then unload it the next morning while I wait for my coffee. Emptying the dishwasher is one of those things you think takes forever but actually takes 2 minutes. Clean Kitchen Counters. In addition to the sink, I make sure the rest of the kitchen counters are clear and clean. It ensures there's no clutter sitting out and that all messes from dinner are cleaned up. It's a million times easier to clean it right away than it is to scrub off baked on dirt. I don't keep anything on my kitchen counters that we don't use every single day. Right now, that's only the coffee maker and Hawkeye's jar of treats. So clean up is super easy. More coming next week on the tools I use to easily keep my dishes and counters clean. Clean Bathroom Counters. I already went over what I use to clean with in last week's post. I don't fully clean the bathroom like that every day, but I do wipe down the counters and sink every day. I do mine while I'm brushing my teeth at night and John does his in the morning. Vacuum the Floors and Carpet. And by vacuum, I mean run the robot vacuum. I usually leave it running while I do to work. Not every day but more than weekly. Usually two days upstairs and two days downstairs. I empty it after each time. Laundry. I like to keep up with the laundry throughout the week, because it's too overwhelming to do it all on the weekend. We don't have a load every single day, but I would say every other day. If John's been working a lot at both jobs, then there usually is something every day. It gets washed and dried, but not always put away. Sometimes it lives in the clean hamper until the weekend when I can mentally prepare myself to fold t-shirts for an hour. Sort the Mail. I don't get mail. Pretty much ever, honestly. I plan on doing a post soon about how I live paperless but one of the ways is to get off every mailing list and make sure I get any statements online. But John still gets mail and since he gets home first (when he's not at the firehouse), he brings it in. It's usually a mess across the dining room table, so I grab what's junk and move it to the recycling, scan anything (using my phone) that's just for notification but needs to be saved, and make a pile of things John needs to take action on. I leave that pile on the table, otherwise he won't do it. Nightly Pick-Up. I feel better if things are straightened up before bed. It only takes a couple of minutes, but I take the time to make sure all those cleaning tasks are done, that shoes are put away, that John has everything for the next day, that blankets are folded and TVs and other electronics are off. 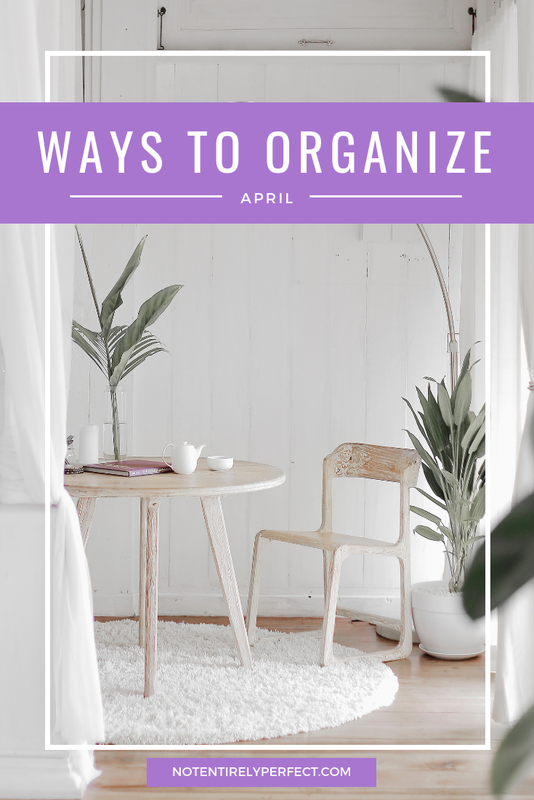 It's the best way to make sure clutter doesn't build up and become overwhelming by Friday. Vacuum the Stairs. Sigh. The one place my little robot can't get to. I loathe vacuuming, so John usually does this job! Mop the Floors. We have a Bona floor cleaning set for our hardwood floors, it's similar to a Swiffer wet jet. The floors dark and matte so we don't use the oil soap stuff. Clean Other Surfaces. I just use the all purpose cleaning spray to wipe down all tables, bookcases, dressers, all the surfaces besides the kitchen and bathrooms I already mentioned. I also clean the appliances in the kitchen, like the front of the dishwasher and fridge and inside the microwave. Clean Inside Fridge. It stays pretty clean so I don't always need to do this, but I do clear it out before going grocery shopping so I can see what we have to work with. If I need to, I wipe down the shelves inside. Clean the Bathrooms. Like I mentioned last week, including the tub and shower walls. Wash Sheets and Towels. I usually do this on Sunday. Since I try to keep up with laundry throughout the week, the washer and dryer are free for these bigger tasks on Sundays. And there's nothing like climbing into freshly cleaned sheets on a Sunday night! I wash the sheets on our bed and put them right back on, and the same in the guest room. No folding of fitted sheets, it's pretty nice. I also wash all the towels that got dirty during the week from both bathrooms and the kitchen. I use my bath towel all week but John gets himself a clean one every other day. How long do you use your bath towel before a wash? Collect and Take Out Trash/Recycling. John keeps up with the kitchen trash throughout the week, same with the recycle. It doesn't usually need to go out to the alley more than once a week. But I also take a minute on Sundays to round up the trash from the bathrooms and laundry room and make sure that gets outside. Our trash day is Thursday, but the cans live in the same spot where the city picks them up, so we don't pay much attention to the schedule since we don't have to put them curbside or anything. Vacuum the Furniture. Since vacuuming is my most hated task, I always delegate this. She removes all the cushions on the couches and vacuums every inch of them. She also vacuums the mattresses. Wash Windows. She washes all the interior windows too, another job I'm not a fan of. Our windows really don't get very dirty, so I don't think she even does this every month, especially in the bedrooms. Clean Vertical Surfaces. That's the best way to describe everything in this category. I clean horizontal surfaces all week long but the vertical surfaces, I save for the cleaning lady. I mean things like baseboards, the wainscotting in the living room and dining room, the fronts of cabinet doors, doors in general and the trim, and all the handles and hardware. Clean Trash Cans. We use bags, but trash cans still get icky and can smell. I wash them out monthly, and put them in the sun to dry and kill germs. Clean the Fans. I don't need to do this more than monthly, they really don't get very dirty. I grab the duster and clean them before she gets to whichever rooms have fans, so she can vacuum anything that falls. Declutter. I always spend a good chunk of time on cleaning days to just declutter. The bookcase in the office especially can get overrun, but I go room by room and make sure everything has a place and is being used. I reorganize the cabinets and drawers and get rid of anything no longer serving it's purpose. Clean Inside Appliances. Some people do this monthly, but our house doesn't require it. I mean cleaning things like the inside of the oven, the drawers of the freezer, etc. Wash Shower Curtains and Liners. Since John has a glass shower door, this only applies to my bathroom. I have a fabric curtain and liner, so I just send them through the washing machine. It's recommended that you do this quarterly, but mine really don't get dirty so I don't do it quite that often. Clean Tops of Cabinets. Our kitchen cabinets don't reach all the way to the ceiling, so the tops have to be cleaned. I delegate this to the cleaning lady as well! Clean Inside Cabinets. They don't get particularly dirty since they are closed, but I like to remove everything about twice a year and really clean inside all cabinets and drawers. Clean Blinds. We have wood blinds, so it's not as much of an issue as having other kinds of window treatments, like drapes. (Giant reason why I don't have drapes, to be honest. Dust magnets.) Although they get dusted monthly, I like to use vinegar and make sure they're totally clean about twice a year. It doesn't take long because we don't have many. Clean Outside. In the spring we clean the outside stuff when the weather is nice. This include the little porch and stairs off of our back door, the outdoor furniture, the exterior windows and the light fixtures. John also power washes the back where the siding is, and the garage. I mentioned most of this stuff in the home maintenance calendar post. Deep Clean Appliances. You won't believe how icky it gets under and behind the refrigerator. Plus those coils need to be vacuumed to keep it running well. We also deep clean the washer and dryer, the oven, the dishwasher, all those things we never really think about. Like the home maintenance calendar, this is just my list and some ideas to get you started on making a cleaning calendar of your own. Your needs are probably different from mine, but I'm sure a lot of the same basics apply. 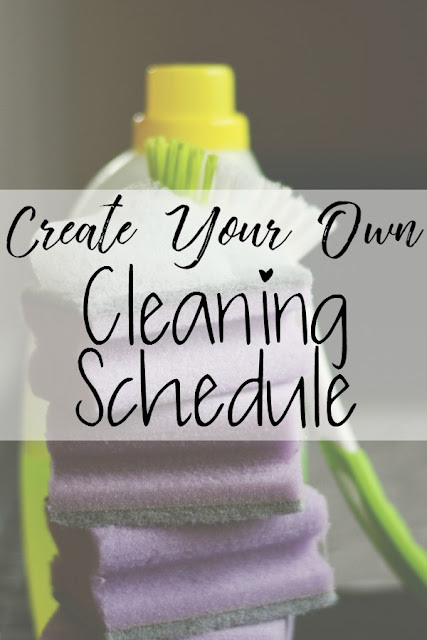 Do you have a cleaning schedule set up?